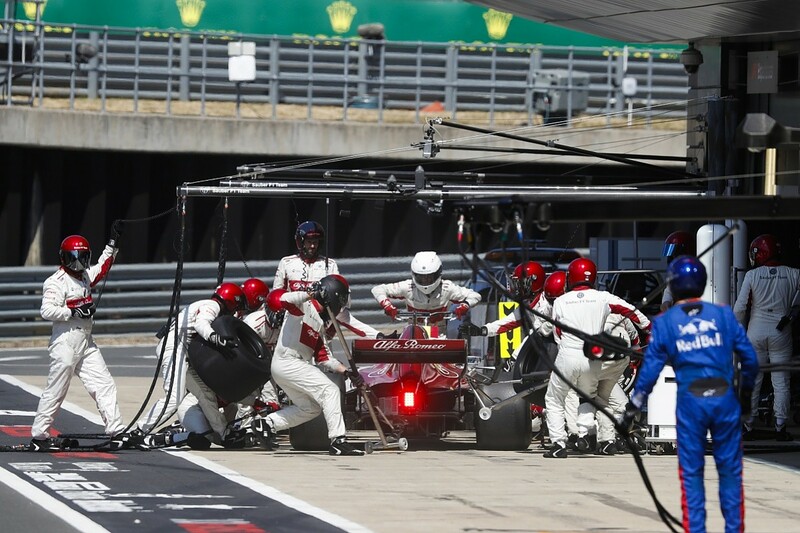 For anyone who gets slightly on edge when lines are not perfectly straight, the Sauber pit box at last weekend's British Grand Prix would have been a place to avoid. Take a close look at a photo of the Sauber area and you can see that rather than the yellow wheel place-markers being perfectly parallel with the white lines of the pitlane, they are very obviously crooked. In a sport where an acceptable tolerance is often less than one millimetre, Sauber's pit box wasn't askew by a tiny margin - it was clearly visible to the naked eye. But there was reason behind this F1 madness: the decision to angle the pit box was all about finding a competitive edge. As part of its quest to eke out every advantage it can, Sauber realised the unique layout of Silverstone's pitlane exit offered it an opportunity. Being the team with the final garage at the end of the pitlane, it was offered a clean run at the exit without needing to rejoin the fast lane. Hence there was no need to have its pit box perfectly square to ensure both the fastest entry and fastest exit. Instead, a slight tilt to the right meant a faster entry, as the driver did not need to turn left as he came in to stop. Plus, it left him perfectly lined up to get a clean run on the way out. The overall benefit may have been just a few tenths (had Sauber of course not made an error in Charles Leclerc's stop itself), but the very fact that F1's bottom team from 2017 is chasing such marginal gains says so much about the scale of its ambitions and progress. Rewind 12 months and Sauber was in a difficult place. Having been saved in 2016 by a deal involving the mysterious Longbow Finance company, Sauber and team principal Monisha Kaltenborn parted ways in June '17 because of differences of opinion about how it should move forward. In came Frederic Vasseur who famously, within minutes of getting his feet under the desk at Hinwil, gave the order for Sauber's intended deal to run Honda engines to be unstitched. It was a typical move from the no-nonsense Frenchman who is ruthlessly committed to the job of being a racing team boss. Having only taken the job if he was sure he had a mandate to do what he felt was right, Vasseur has since left no stone unturned in putting together the pieces required to make the progress. He went the extra mile when sorting out a new customer engine deal with Ferrari: adding on to it the first stage of the Alfa Romeo partnership. He pulled off a big win in getting Ferrari to place Charles Leclerc at Sauber. And he went aggressive with team recruitment. Yet, despite it being obvious that big change was needed, Vasseur did not approach things like a bull in a china shop and make change for change's sake. He watched, he listened, he thought about it and then he acted. "From the outside, a Formula 1 team is a very complex animal," he says. "And you only realise how complex it is once you're part of it. "The first races I attended with the team last year gave me the opportunity to meet the people, its organisation, and I took a bit of time to look and discover this team that - honestly - I didn't really know beforehand. Gradually, and towards the end of last year, I started to have a better picture of the team." Change duly came, but Vasseur has never deviated from his path of doing what he felt was right to move the team forward: even if it has meant some uncomfortable moments. 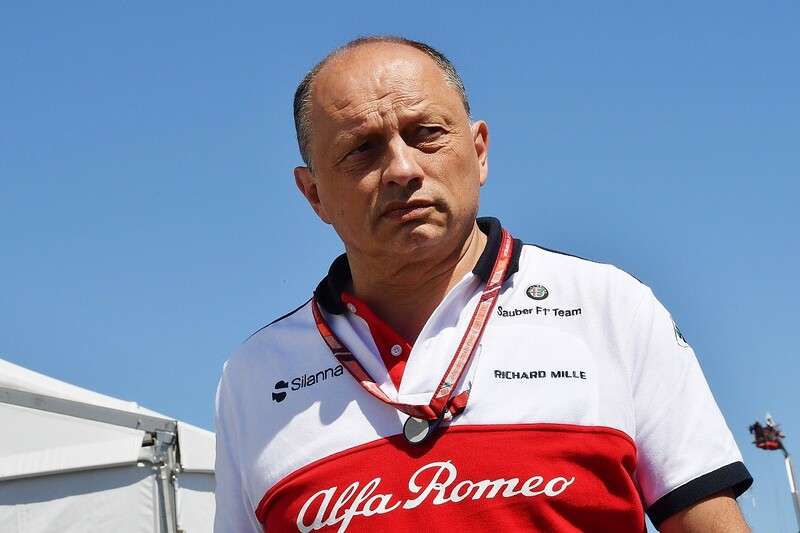 Technical director Jorg Zander left as he and Vasseur did not share a common vision for the team's future; and Ferrari's former chief designer Simone Resta was drafted in to replace him. There have been changes at the top of the aero department too. The overhaul hasn't just been consigned to the factory either. Vasseur sat down with team manager Beat Zehnder to overhaul Sauber's approach to pitstops as well - because there is, after all, little point producing better machinery if the time gained is then wasted in changing tyres. Sauber revamped its equipment, it decamped its mechanics to the famous Formula Medicine clinic over the winter, and there has been a whole new approach to preparation and practice at race weekends too. The results have been impressive. From starting the campaign producing stops just under 2.98 seconds, Sauber raised the eyebrows of its rivals when it produced the best times of all in Monaco, Canada, and France. It best overall effort of 2.21s came in the tight confines of Monte Carlo. The level of progress is the perfect indication of the kind of positivity that comes when an organisation makes changes for the better, rather than being forced to do things differently because things are not working out. As well as the fresh injection of enthusiasm that new talent brings, an organisation that sees change happening for good also sees its stalwarts more motivated, and eager to go that extra mile in a bid to do better. 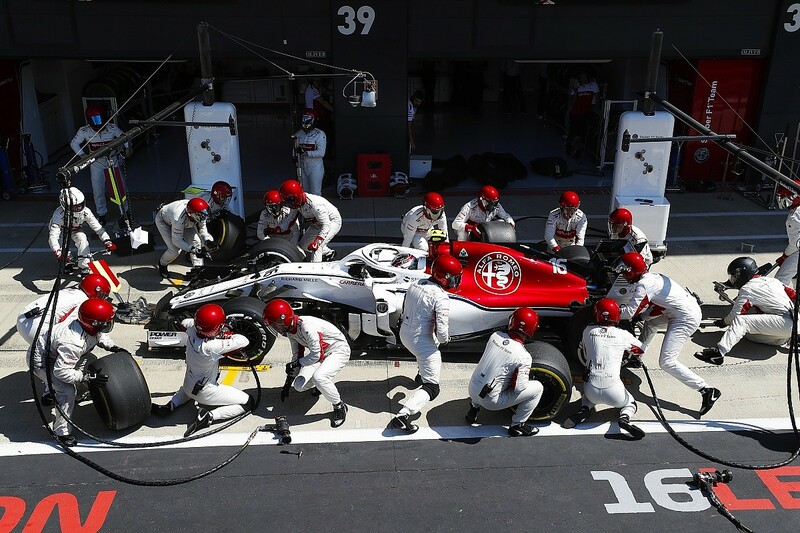 From the drivers (with Marcus Ericsson losing 5kg over the winter), to the mechanics in the pitstop crew, to the decision to mark out the pit box at Silverstone, at every step of the way Sauber is thriving on a renewed ambition. "The main problem with Sauber is that the team had suffered for a long time from financial difficulties and had lost quite a few people," adds Vasseur. "It's very difficult and time consuming to rebuild a Formula 1 team. "You have to hire new people, and most of the time, they work for other teams, they have to respect periods of gardening leave, so it takes sometimes months to have these new people in place. "Take for example the aerodynamicists. They can only join the team three or four months after, and they will only start working on next year's car. That's the way things work. Even though we'll only see the results in a year or so, we have to be patient because that's how F1 works." That time for patience is now. While Leclerc continues to grab headlines and Sauber keeps on shining in the midfield, Vasseur knows that even closing on Toro Rosso to take eighth in the constructors' championship will not be reason for huge celebrations just yet. This is just the start of Vasseur's long term project. He needs to integrate new staff (another seven joined on July 1), keep up the recruitment drive, plot potentially closer ties with Ferrari to maximise the Alfa Romeo partnership and then balance out dividing resources between this year's car and the 2019 version. And all the while the current season gets better, and Leclerc pushes on with star performances, Vasseur knows that it only makes it more and more likely that Ferrari will come to take its youngster to Maranello. 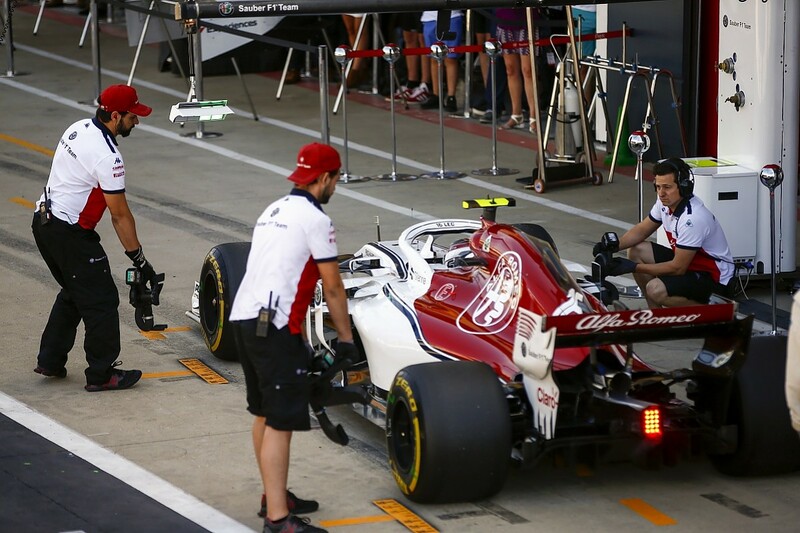 But considering the state Sauber was in little more than a year ago, when thoughts of a wonky pit box would have been at the very bottom of the team's to-do list, Vasseur accepts that there is such a thing as a good problem to deal with. "It is much better to manage things when you are doing well, than when you are at the back."